As of March 18, the Cleveland Cavaliers have played 14 games since acquiring Ben Wallace, Joe Smith, Wally Szczerbiak and Delonte West in exchange for six players. There are 14 games left in the regular season, so now is a perfect time to issue a â€œmid-termâ€ report card about the tradeâ€™s impact on the Cavaliers. Obviously, final grades will not be issued until the playoffs are over. In the first game after the trade, the Cavs were not able to use their new players but they still managed to eke out a one point win over a Washington team that was without the services of injured All-Stars Gilbert Arenas and Caron Butler. Since that time, except for one missed game by Szczerbiak and one and a half missed games by Wallace, the new Cavs have played in all 13 games. Cleveland went 7-6 in those games. Other than a 92-87 road loss to the Boston Celtics, Cleveland did not face any teams that would be considered legitimate championship contenders; in fact, the majority of those games were against teams that will not even make the playoffs. Clearly, being one game above .500 against that kind of competition is hardly a ringing endorsement of the deal. Of course, there are a couple extenuating factors that must be considered.First, the Cavaliers are basically conducting training camp on the fly as they integrate the new players into their offensive and defensive systems and the new and established Cavs get used to playing with each other.Second, injuries have sidelined several key players, hurting the teamâ€™s depth and hindering efforts to establish a regular rotation and get everyone settled into their roles. Starting center Zydrunas Ilgauskas missed eight of these 13 games and the Cavaliers only went 4-4 in his absence.Sharpshooter Daniel Gibson missed all 13 games. Sasha Pavlovic missed the first nine games.Contrary to popular belief, the presence or absence of players other than LeBron James has significantly affected the Cavsâ€™ performance at various times this season.The team clearly struggled at the start of the season when Pavlovic and Anderson Varejao were holding out. Also, in several of the games that the team lost when James did not play other key playersâ€”notably Varejao and Larry Hughesâ€”also were out of action. James is by far the most important player but a close examination of this season shows that the Cavs need to have most of their eight man rotation intact in order to be successful, particularly against good teams.Considering that the team needs some time to adjust to the big trade and that injuries have taken an important toll recently, one could say that the â€œmid-termâ€ report card should read â€œincomplete.â€ However, it is worth taking a closer look at the individual performances of the new players in order to try to project what their impact will be in the future. Before doing that, though, it is interesting to consider what effectâ€”if any–all of this change has had on Jamesâ€™ production. He averaged 33.4 ppg, 7.6 rpg and 7.4 apg during the 13 games, shooting .487 from the field, .316 from three point range and .732 from the free throw line. How do those numbers compare to his season-long performance? His scoring is up significantly (more than 2 ppg), his free throw percentage is up marginally, his assists and field goal percentage are essentially unchanged and his rebounding is down slightly. There has been much talk about how much work James has put into his shooting stroke but his three point shooting percentage has declined for the third straight year and his free throw percentage is below his career average. James remains a streak shooter from both areasâ€”and, unfortunately, the cold streaks last a lot longer than the hot ones: he shot 7-13 from three point range in his 50 point game in New York but he shot just 17-63 (.270) on three pointers in the other 12 games. Take out his 5-8 performance against Indiana and the numbers not only drop to 12-55 (.218) but he shot less than .300 from three point range in each of the other 11 games. His free throw shooting is not nearly as bad but is similarly inconsistent, ranging from back to back 11-12 outings to games in which he shot 2-5, 10-16 and 16-23. Clevelandâ€™s offense is heavily dependent on Jamesâ€™ ability to drive to the hoop and finish with authority combined with his great passing skills. The hope that Szczerbiak would relieve some pressure from James by making outside shots has not yet been realized. Szczerbiak is averaging just 9.2 ppg with the Cavs while shooting .313 from the field and .349 from three point range. He has not lost his shooting touchâ€”as shown by the fact that he has made 23 of 24 free throwsâ€”but as a Cav he has not shown the ability to consistently make open jumpers in game situations. Even more worrisome, his recent numbers read like a countdown to oblivion: 31, 13, 10 and six minutes played resulting in seven, six, three and two points scored. His defense has never been great, so Szczerbiak seems to be playing himself right out of the rotation. Some publicity seeking wiseguys created a website specifically devoted to imploring Larry Hughes not to shoot, so it is worth mentioning that since the trade Hughes has averaged 15.3 ppg for the Bulls while shooting .406 from the field and .359 from three point range. He is playing more than 33 mpg and it should go without saying that his defense is much better than Szczerbiakâ€™s. 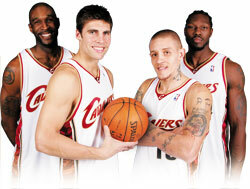 Delonte West is probably the newcomer who has made the smoothest transition. Coach Mike Brown immediately installed him as the starting point guard and he has averaged 9.9 ppg, 4.2 apg and 3.9 rpg. He has already had a 20 point game, he had eight rebounds in another contest and he has posted seven assists twice. On the other hand, his field goal percentage (.426) is below his career average and even though he can help the Cavs at times in terms of pushing the ball up the court he has never been the type of player who can consistently get into the paint and draw fouls; West has attempted only 19 free throws in 13 games as a Cav and in six of those games he did not get to the free throw line even once. Drew Gooden played an important role in Clevelandâ€™s success, so Ben Wallace must be productive for the trade to be considered a success. So far, the best that can be said is that the results have been mixed. Back spasms caused Wallace to miss the second half of the Portland game and all of the next game versus the Nets. Perhaps they have limited him in other games as well; he has averaged 5.4 ppg, 8.3 rpg and 1.4 bpg as a Cav. Wallace has reached double figures in rebounding just three times as a Cav. His offensive limitations are well documented andâ€”although I believe that he can be productive offensively as long as he sets screens, crashes the boards and finishes around the hoopâ€”the fact that no one on the roster has emerged as a dependable scorer to complement James and Ilgauskas is worrisome and puts more pressure on Wallace to provide something at that end of the court. Gooden rebounded just as well as Wallace does and he is a much better shooter and scorer. Joe Smith has been solid, if unspectacular, averaging 8.5 ppg and 6.1 rpg while shooting .487 from the field and .658 from the free throw line. He can step out and make the midrange jumper and he is rebounding well for the amount of minutes that he plays. Smith does not have three point range like Donyell Marshall but it is fair to say that this exchange was without question an upgrade for the Cavs. Before the Cavs made this trade I asked Is the Status Quo Really So Bad for the Cavs? I argued that the Cavs should not break up the team that made it to the Finals unless they could make a deal that significantly improved the teamâ€™s chances to win in the playoffs. It is still possible that the positives of this tradeâ€”more frontcourt depth, Szczerbiakâ€™s outside shooting, Westâ€™s ability to play point guardâ€”will outweigh the negativesâ€”questions about how much Wallace has left in the tank, Szczerbiakâ€™s defense, whether or not the overall production of the â€œnewâ€ team in the playoffs will really match what the â€œoldâ€ team did last year–but so far the Cavaliers do not look like a better team now than they did either last season or even this season when the roster was completely intact. That said, it must be emphasized that this trade cannot be fairly and completely evaluated until all of the key players are healthy and we see how the team performs in the playoffs; if the Cavs get healthy, rededicate themselves to playing good defense on a nightly basis and get solid offensive production from someone other than James and Ilgauskas then they will still be a formidable playoff team. David Friedman is a freelance writer specializing in professional basketball. His work has been published in several magazines, including Hoop, Lindy’s Pro Basketball, Basketball Times and Basketball Digest. He has also contributed to NBCSports.com, HoopsHype.com and ProBasketballNews.com and his articles are frequently reprinted at Legends of Basketball, the official website of the National Basketball Retired Players Association (NBRPA). Friedman wrote the chapter about the NBA in the 1970s for the anthology Basketball in America (Haworth Press, 2005). Check out his basketball blog: 20 Second Timeout.